We are delighted and very proud to say that FOUR businesses from Stanley Grange Business Village were finalists in the Knowsley Business Awards last week, three were awarded “Highly Commended” in their category at a glittering ceremony at Knowsley Safari Park on Thursday, 23rd November. “As CEO of both NeedleSmart and CAL International it is with a sense of tremendous pride that we can reflect on the year that both Businesses have had in 2017. Speaking firstly of CAL International we were obviously disappointed to not figure in the final two, however we take enormous pride in being one of the final five in the Small Business of the Year category 2017. 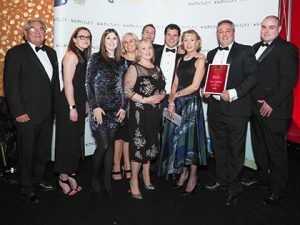 Since first moving to Stanley Grange the Business has evolved and grown so significantly it is almost unrecognisable from the initial team of 2 in 2015. We are absolutely blessed with our team and the location from which we do business. With reference to NeedleSmart we are very happy to have received Highly Commended Newcomer of the Year in the 2017 awards. Stanley Grange is the first true Office space NeedleSmart has had. The location and setting have proved not only to be a fantastic environment for the development team to engineer the product range, but also a fantastic setting to host various groups of Investors and Healthcare professionals alike. NeedleSmart will launch products to the market in 2018.. Of course the Launch Party will be held at Stanley Grange! The management team at Stanley Grange offer huge congratulations to all our tenant’s for their fantastic achievements.